Are you ready!?! We are gearing up to put on some killer shows for our fans first in Salt Lake City, UT (11/16) and then in Denver, CO (11/17). Don't miss our final shows before the holidays! Click here for tickets and details! Yesterday at the Independent Music Awards at the Lincoln Center in New York City our debut album was named as "Best Album" in the Pop Category! We are SO honored to have had industry professionals vote for and support our music. We are elated to announce our first ever 80's costume party/concert! Friday October 14th at Velour Live Music Gallery in Provo, UT at 8 PM. YOU rock the 80's attire, Hive Riot rocks the stage! What could be a better way to get into the Halloween Spirit! Featured performances from out new friends AMZY. Prizes, treats, and face paints! Click here for tickets! Throw back to our concert at Webster Hall in New York last month. A huge thank you to everyone who came and had fun that night. You guys helped make the night such an amazing success! We will definitely be back. Our music video for "Undercover" releases tomorrow! Until then, watch this behind the scenes video to get an inside look! At the epicenter of the music scene in Utah, there is Velour Live Music Gallery. And the genius and dear friend behind Velour is Corey Fox. Other than hosting all of our shows, he has also done the art direction for many music videos of Utah based artists (as well as many well known bands outside of Utah). Corey has helped all of us and now it's our turn to help him. You see, right now he could really use a kidney. He is on a long wait list and he is at a point where time is of the essence. On April 29th and 30th Velour will be hosting a two-night benefit concert featuring some of its most successful artists. Neon Trees and Imagine Dragons will take the stage Friday April 29th. Tickets go on sale April 23rd from 2-5 pm at Velour for $300. Saturdays performance will include The Moth & the Flame and Fictionist (Tickets are on sale now here.) Ticket sales will contribute to Corey's surgery costs and to help support Velour while closed this summer. Monetary donations are also extremely helpful at this time. Read how you can help here. We couldn't be more excited to play at the Utah Pride Festival on June 4th! Come join us while we rock out on the Vodka Stage at 8:00 p.m. Save the date! Its Easter time! What could be more fun than todecorate some Hive Riot inspired eggs for your Easter baskets. First step in creating these fun easter eggs is to paint your eggs with a base color. We chose black! If you are using plastic eggs, there are some chalkboard eggs that already come black and can help speed up the process. When the base color has dried, use the sponge brush to add your other layers of color on the egg (giving each layer some time to dry). We chose to sponge a layer of hot pink paint on to the egg! 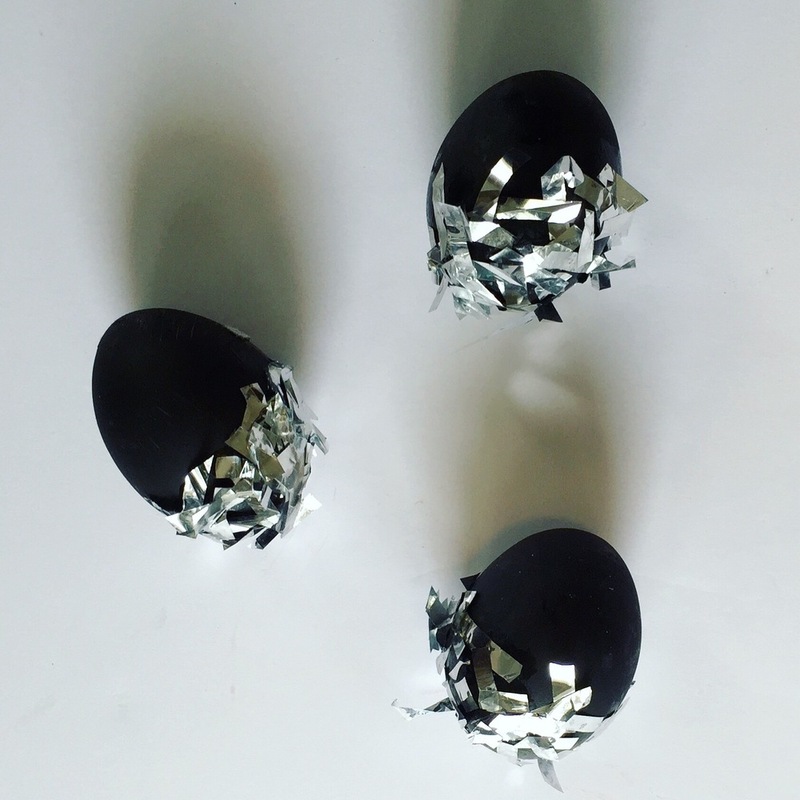 To make our eggs pop, we added a layer of glitter spray paint. Are you guys ready for another music video from Hive Riot? We know we are! We spent Saturday on set filming the music video for our song Undercover. The video will be featuring some amazing local dancers. A big thank you to our producers and directors Jed Wells and Gavin Bentley, our crew, and all of our incredible extras who came to help out. We had such a great time dancing the day away (in fact we are a little sore from it all)! Stay tuned for the official release! Last Saturday night Hive Riot held our first concert ever! We celebrated the release of our new album with a completely sold out show at Velour in Provo UT. We were very privileged to be able to preform for all of our local fans. We had such a fun and incredible night! Doors to Velour opened at 8PM where treats, hive riot face paints, and a funky photo booth greeted fans while we anxiously waited for the show to start. Coral Bones kicked of the night with an amazing opening performance. It was an exhilarating experience and so surreal to see all our work come together to share this performance with everyone. We loved getting to meet so many of our fans in attendance after the show. Thank you all for a wild and wonderful night, and for being a part of our journey. We couldn't have done it without you! We are super excited about our spread in the January issue of Utah Valley Magazine! We had the chance to sit down and chat with editor extraordinaire, Jeanette Bennett, and talk about the origins of Hive Riot and our new album (you know, the one that comes out THIS FRIDAY on iTunes!!! ).